It might come as a shock to you that the Dolphins' offensive line did not perform at an ideal level in 2013. 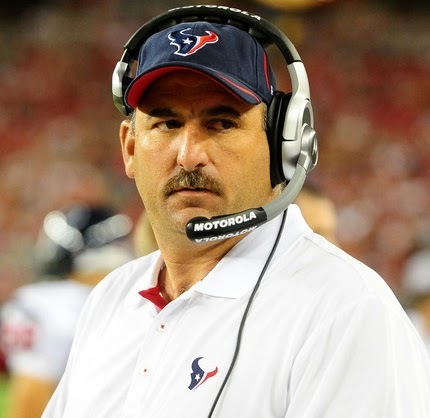 To that end, the team has added a quality name to the coaching staff in John Benton, who spent the past eight seasons as the Texans' offensive line coach but was let go upon the arrival of Bill O'Brien. offensive lines in the NFL in Houston. Prior to joining the Texans in 2006, Benton worked with the Ram' offensive line in 2004-05. He became his career as a graduate assistant at Colorado State (1987-90) followed by a stint as OL coach and recruiting coordinator at California University (Pa.). He served as Colorado State's offensive line coach from 1995-2000, while adding the title of co-offensive coordinator from 2000-03. Despite the regime change in Houston, it's a little surprising that he was let go given the immense success of the Texans' offensive line in recent years. His tutelage has led to Pro Bowl selections of center Chris Myers, tackle Duane Brown, guard Wade Smith (a former Dolphins castoff), and, indirectly, running back Arian Foster. Benton joins offensive line coach Jim Turner on Joe Philbin's staff, though it remains to be seen whether Turner will maintain his job in Miami in 2014 after such a dismal performance by his unit last season. Some have speculated that he could be made the scapegoat after the Wells report investigating the Martin-Incognito scandal comes out next month, but I personally would rather have severed ties at the same time Mike Sherman was let go and just be done with it rather than waiting for a chance to fire him with cause. For now, Benton will assist Turner in the monumental task of shaping and building what looks to be a very different offensive line. Only center Mike Pouncey is a lock to return in 2014 (barring any legal issues in the Aaron Hernandez case), while the team's free agents include Bryant McKinnie, Tyson Clabo, Richie Incognito and John Jerry. The Dolphins are certainly looking at 3-4 new starters in 2014, quite likely a mixture of free agents (high-priced or stopgaps) and draft picks. Benton installed a highly-successful zone blocking scheme in Houston, which is something the Dolphins' have lacked the personnel for in the last two years despite it being Philbin's style as well. If the Philbin, Turner, Benton and new GM Dennis Hickey can all get on the same page, the impact of this hire could eventually be a great one with a fresh start in 2014 and the potential to build a quality, cohesive line for years to come. Just as I did with ex-Cowboys and Jets when Bill Parcells arrived in 2008, I'm going to take a look at some notable current or former Buccaneers players set to hit the open market to see if there is any talent that might attract new Dolphins GM Dennis Hickey. as an undrafted rookie with the Bucs in 2010. Not to be confused with the Broncos' safety, this Mike Adams spent six years with the Cardinals before signing with the Bucs last June. A knee injury landed him on injured reserve after Week 11, however, and the 29 year old with seven NFL starts under his belt isn't going to be a free agent commodity. Despite a nine-sack season with Tampa Bay in 2012, the Bucs let Bennett walk in free agency last offseason. He actually visited the Dolphins before inking a one-year deal with the Seahawks. Despite rotator cuff surgery in the offseason and a few early-season injuries, Bennett has been a stud for the NFC-champion Seahawks with 8.5 sacks in just 617 regular season snaps. Despite his talent, Bennett obviously isn't fit for the Dolphins. 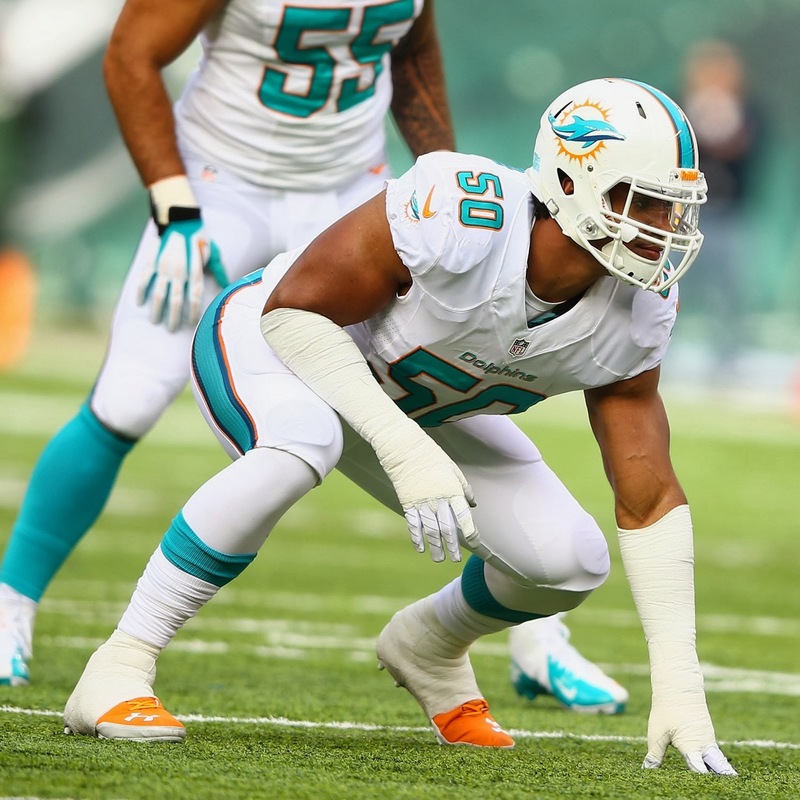 Cameron Wake is still going strong, Olivier Vernon is coming off an 11.5-sack season and 2013 third-overall-pick Dion Jordan certainly looks to have an expanded role in 2014. 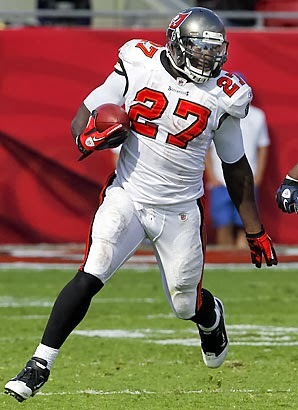 A quality talent with maturity issues, Blount rushed for over 1,000 yards as a rookie with the Bucs in 2010, only to struggle the next two seasons. He was dealt to New England in 2013 for a seventh-round draft pick, shuffling between large and small roles in Bill Belichick's confusing backfield. He's entering free agency with a huge 4-touchdown game in the divisional round fresh in people's minds, so he should have a number of suitors in free agency at age 27. While the offensive line is certainly more of a problem than Lamar Miller is, Blount would certainly be of use to the Dolphins as an ungrade over Daniel Thomas. However, I suspect the Dolphins wouldn't be willing to give him much guaranteed money and running backs are best found in the draft, anyway. A former undrafted free agent, Casillas spent four seasons with the Saints before joining the Bucs in 2013. He wound up leading the team with 10 special teams tackles and while the defensive upside isn't there, he's a worthwhile cheap addition for any team, including the Dolphins. 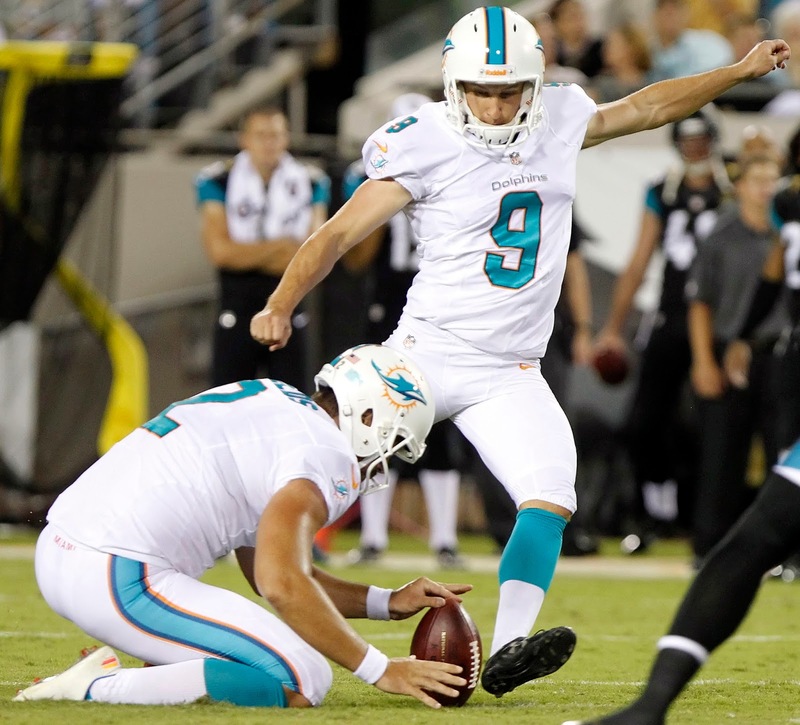 He's been the Bucs' long snapper since 2006, but if the Dolphins are going to replace John Denney and his $865,000 salary (very unlikely) it'll be with a younger, cheaper player than the 31-year-old Economos. A former first-round pick of the Bucs, Freeman had a tremendous 2010 season (25 touchdowns, six interceptions, 95.9 passer rating) but has since tailed off. A rift between Freeman and former Bucs coach Greg Schiano ultimately led to the quarterback's release, and he didn't fare much better in Minnesota in 2013 after being thrust quite quickly into the starting lineup. The Dolphins could certainly be in the market for an experienced backup given Matt Moore's age and potential $4 million cap savings, but Freeman isn't a fit. He's got upside, but he'll be looking for an opportunity to start right away and playing behind a young quarterback like Ryan Tannehill isn't the ticket. A journeyman and former undrafted free agent, Gibson has spent time with the Ravens, Panthers, Rams and Buccaneers. He started all 16 games for the Rams in 2010, but has made just three starts since including one in 2013. The Dolphins are thin at defensive tackle with free agents Randy Starks and Paul Soliai, but Gibson would represent nothing more than a camp body and potential backup at the position. The 29-year-old Hayward has been a backup and special-teamer with the Bucs since being drafted in the sixth round in 2007. There isn't defensive upside here, but he did finish second on the team behind Casillas with 8 special teams tackles. His 11-touchdown season with the Browns in 2010 a distant memory, Hillis has bounce around the league since with little success. That includes a stop at Bucs training camp in 2013, where he ended up making the team but was released in September without playing in a game. He later rushed for two touchdowns on a 3.4-yard average in seven games with the Giants. Like I said on Blount, the Dolphins could certainly use more talent at running back, but at this point I'd take Daniel Thomas over Hillis. There's simply no upside here and the Dolphins should aim much higher. A Miami native and sixth-round pick out of NC State in 2010, Larsen has started 31 of 60 games played in four seasons, but opened just four contests in 2013 and has generally graded out poorly. He has the ability to play some guard as well, but would be nothing more than a depth signing in Miami and is probably no better than 2013 undrafted rookie Sam Brenner. A hybrid sort of back, Leonard's Rutgers connections brought him to Tampa in 2013 under Greg Schiano. His performance in 2013 was par for the course with him, averaging 3.9 a carry and catching 29 passes out of the backfield. He's nothing more than a second or third back, but he does have value as a third-round back and a quality pass protector. The 37-year-old Lindell converted just 79.3 percent of field goals in 2013, and while that is better than the Dolphins' Caleb Sturgis (76.5), there's no way he's replacing Miami's 2013 fifth-round pick. The team will look elsewhere if they decide to bring in competition. A seventh-rounder in 2010, Lorig has served a the Bucs' starting fullback for each of the past three seasons. He graded out poorly as a run blocker in 2013, but considering he'd come cheap and the Dolphins didn't use a true fullback for most last season (tight end Michael Egnew was forced into the role), it's not impossible he could be brought in to compete. Selected by the Packers in the fifth round in 2009, Meredith has bounced around with six teams in five pro seasons. He's started 20 games for the Bucs over the past two seasons (playing both guard spots), but he's routinely graded out poorly and the line-needy Dolphins can do much better. The Cowboys had high hopes for the undrafted Ogletree, but he never really developed and spent time with both the Bucs and Lions in 2013. Dolphins' slot receiver Brandon Gibson is iffy coming back from a knee injury, but I don't suspect Ogletree could even supplant Rishard Matthews an thus I don't see any interest here. A fifth-round pick in 2005, Orlovsky has played nine seasons for the Lions, Texans, Colts and Bucs. He's 12 games in his career and had 14 touchdowns against 12 interceptions as a pro, but he only threw seven passes for the Bucs in 2012 and did not attempt a pass. He's certainly an OK backup and would be much cheaper than Matt Moore, but the Dolphins might be better off with a more long-term option. 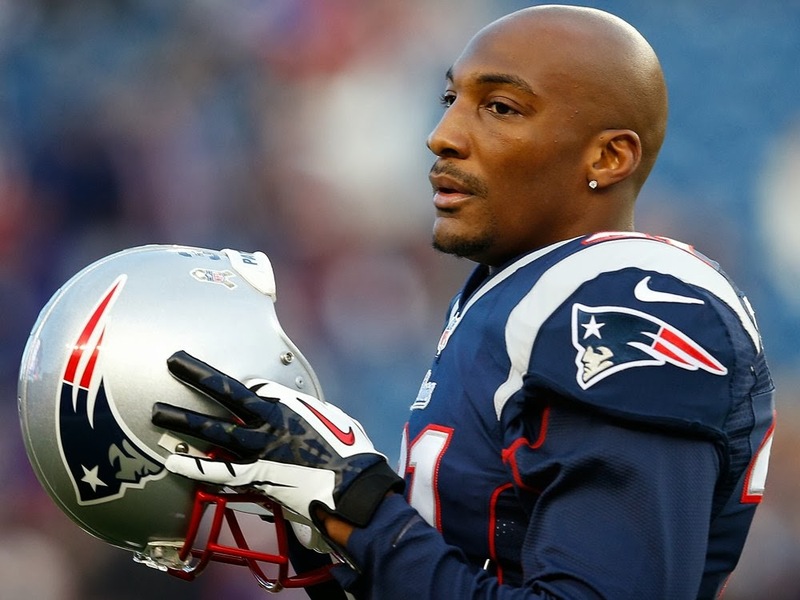 A former first-round pick of the Bucs in 2008, Talib's talent has never been in question. He picked off 15 passes in his first three seasons (including a career-high six in just 11 games in 2010) but he's also had his share of off-the-field issues with multiple arrests. He proved to be steal for the Patriots, who got four interceptions and a Pro Bowl selection out of him on a one-year deal. The 27-year-old Talib could command a hefty contract his offseason and comes with a fair share of risk. However, it's possible he could be on the Dolphins' radar if they fail to re-sign Brent Grimes (and assuming Hickey wants anything to do with him). selected to his first career Pro Bowl with the Patriots in 2013. A third-round pick by the Eagles in 2010, Te'o-Nesheim has just 6 sacks in four pro seasons and totaled just 1 in 2013 despite 12 starts and over 600 defensive snaps. I have no problem with him being brought in as a camp body, but don't expect anything out of the guy PFF graded the worst 4-3 end in football this past season. A homeless man's Mike Wallace, the former seventh-round pick out of Rutgers had a career-high four touchdowns in 2013 but has never been able to put it all together. He'd be suitable camp competition but I question whether he'd even crack the Dolphins' top four (assuming a healthy Brandon Gibson). A seventh-round pick in 2010, Watson has primarily worked on special teams for the Bucs but did play 263 defensive snaps in 2013, totaling career highs in tackles (42) and sacks (2.0) and grading out positively according to PFF. He'd make for nice backup competition in Miami and honestly couldn't be any worse than Philip Wheeler, not that it's difficult to do that. Throughout January, I'll be reviewing each position's performance for the Dolphins during the 2013 season, noting the good and the bad play and looking ahead at where the position stands for the 2014 season and beyond. Check out the archives for past entries in the series. were already well-documented before their departures. You know how negative my linebackers review article was? Think of the Dolphins' offensive line as the "linebackers of the offense." For all you can say to defend Jeff Ireland (and there is plenty to say, especially after the team's recent joke of a GM search), one thing you can criticize him for is his horrendous plan (or lack thereof) for the Dolphins' offensive line in 2013. I'm not going to get into the Jonathan Martin-Richie Incognito scandal here, in large part because 1) it was massively overblown by the media; 2) the Dolphins survived the scandal on the field; and 3) the offensive line was terrible before those two exited the lineup, anyway. Center Mike Pouncey was the lone bright spot on an offensive line that could do no right elsehwere, grading out as Pro Football Focus' No. 13 center (No. 1 in pass protection) despite missing two games with a gallbladder issue. Incognito, actually, was solid as always before he was suspended by the team, and the six sacks he allowed is somewhat misleading thanks to quarterback Ryan Tannehill's complete inability to sense pressure that's right in front of his face. Beyond that, it was nothing but ugly. John Jerry continued to be a poor fit for the team's blocking scheme is is curiously horrible as a run blocker for someone that should be such a mauler. We might only be four seasons into his career, but something tells me Jimmy Graham would've been a better pick in the third round of the 2010 Draft because Jerry doesn't have a single good season under his belt. When Incognito was suspended, the Dolphins turned to undrafted rookie Sam Brenner at left guard. While some fans seem high on the guy, the reality is that he was blatantly over-matched and he predictably grade out negatively in all facets. And then, we have the tackles. Where to even begin. Jonathan Martin was over-matched in all facets on the left side, grading out poorly in pass protection and as a run blocker. While I certainly understand letting Jake Long walk in free agency due to durability concerns, there's little doubt in my mind Martin was to be a failed second-round pick even if he hadn't cowardly abandoned the team midseason. Replacing Martin at left tackle was Bryant McKinnie after a midseason trade with the Ravens. While the Dolphins likely gave up nothing of much value (I suspect a conditional seventh or something similar based on McKinnie's starts in Miami), he certainly wasn't an improvement. Laughably, Baltimore McKinnie ranks 67th in PFF's offensive tackle rankings, while Miami McKinnie ranks 65th. Therefore, McKinnie actually makes up two of the worst 12 tackles in the NFL last season. Having watched him play, that sounds about right. Last, we have Tyson Clabo. It was actually a tail of two seasons for Clabo, who came over a one-year deal after a steady career in Atlanta. Despite a proven track record, Clabo was absolutely lost in the first half of the season, getting benched at the right tackle spot seven weeks into the season after allowing eight sacks and 18 hurries in the team's first six games. He was re-inserted into the starting lineup in Week 9 following Martin's departure, and actually performed well down the stretch with 3 sacks in the last nine games. The Dolphins' line certainly can't get much worse than it was in 2013, but the situation remains far from ideal. Only center Mike Pouncey is under contract and projected to start next season. And even then, ties to the Aaron Hernandez trial are certainly a cause for some concern. McKinnie, Clabo, Jerry and Incognito are all unrestricted free agents, with Incognito almost certainly gone after the scandal and the others hardly worth bringing back anyway. In all honesty, Clabo might be the best bet to return on a one-year deal as a stop-gap at right tackle, assuming he can continue his quality of play from late in 2013. That means at best, the Dolphins are looking for three new starters on the offensive line, and four if you move on from Clabo. It seems unlikely that Brenner, Dallas Thomas, Nate Garner, Will Yeatman (RFA), Danny Watkins (RFA) or anyone else currently on the team has the talent or upside to start, which means the Dolphins will have to focus heavily on the draft and free agency. If the Dolphins go the free agent route for a new left tackle (expensive, but safer in the short-term), Branden Albert (Chiefs), Eugene Monroe (Ravens), Jared Veldheer (Raiders) and Anthony Collins (Bengals) are all potential options. Rodger Saffold (Rams) has a lot of appeal at age 25, but is also a durability concern. The Dolphins could also fill a guard spot in free agency, with Jon Asamoah (Chiefs) and Zane Beadles (Broncos) leading the pack. Of course, building through the draft is much more ideal from cost and longevity perspectives, and the Dolphins may look at a tackle or guard with the 19th overall pick in April. While the top tackles are likely to be gone by the time Miami picks, someone like Taylor Lewan (Michigan), Zack Martin (Notre Dame) or Cyrus Kouandjio (Alabama) could fall to that spot. We'll have a much clearer picture of what direction Joe Philbin and Dennis Hickey are heading once free agency begins in March, but with so many holes to fill, it's almost certainly going to be a mix of free agency and the draft. I would prefer to focus primarily on the draft, but I also realize that starting 3-4 rookies isn't a realistic scenario either. Needless, to say, the Dolphins brass has its hands full when it comes to protecting Tannehill and bringing this offense into the upper half of the league. It's not because he's the most qualified or the most coveted, but more likely because he was the only fresh face remaining in the pool. 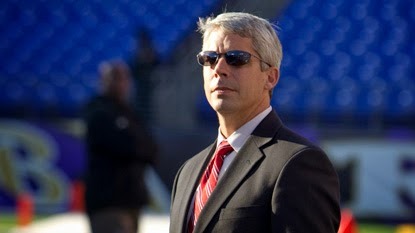 Buccaneers director of player personnel Dennis Hickey is indeed the next general manager of the Miami Dolphins. Dennis Hickey, 43, spent the last 18 seasons in the Bucs' organization. He replaces the departed Jeff Ireland, who was fired on Jan. 7 after six seasons on the job. Now, there may actually be Dolphins fans that regret that move. Hickey's only pro experience comes from spending the last 18 years in Tampa Bay, including the last three in his current title under GM Mark Dominik. who was fired this offseason. He previously spent six years as the Bucs' director of college scouting after initially working as a pro personnel assistant and then a college scout. He was in the college scouting department in 2002 when the Buccaneers won their first and only Super Bowl title over the Oakland Raiders. Prior to working for the Buccaneers, Hickey served as an assistant coach and in-state recruiter at Blinn (Tex.) Junior College after playing defensive back at Tulsa, graduating in 1994. If you're wondering what "settling" looks like, this is it. Despite a great cap situation, a roster certainly not lacking in talent and a team that was one win away from the playoffs last year, the Dolphins failed to attract any of their top choices for the job thanks to a confusing power structure and an embarrassing owner that has no idea what he's doing in Stephen Ross. Hickey is clearly the Dolphins' last resort, who seemed set on hiring anyone but in-house candidate Brian Gaine and named Hickey GM only after he and Gaine remained. Numerous other candidates spurned the team for other opportunities (Jason Licht becoming the Bucs' GM) or to remain in lesser roles elsewhere (Ray Farmer in Cleveland, Lake Dawson in Tennessee and Nick Caserio in New England). Dawson and Caserio both dropped out during as finalists after second interviews this weekend, while a Saturday report even had Caserio having been offered the job only to turn it down almost instantly. Caserio would have been a huge win for the Dolphins after such a bleak process, but of course it was too good to be true. None of us can really comment on Hickey's capabilities as a general manager. He could be a dud or a star. Tampa Bay, despite its recent struggles, certainly did well drafting and bringing in talent, and Hickey may have played a large role in that. The issues are not so much with Hickey himself, but rather the process that clearly had him as a last resort. Ross made the job so unattractive thanks to his meddling nature, his insistence on keeping Joe Philbin on as head coach and the power given to capologist Dawn Aponte. Any self-respecting GM candidate would see the scenario and run, leaving only someone inexperienced and hoping to make a name for himself in the mix. Given Ross' indecisive nature and his complete unwillingness to ever totally "clean house," it's hard to be optimistic for the future. We have no idea who is really making the decisions right now and if everyone is on the same page, and that's rarely (read: never) a recipe for success. A long 18 days after parting way with general manager Jeff Ireland following a mediocre six-year stint, the Miami Dolphins appear poised to name his replacement. 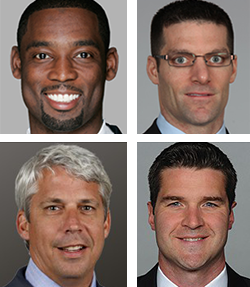 The team conducted second interviews with four candidates this weekend—Nick Caserio, Lake Dawson, Brian Gaine and Dennis Hickey—and reportedly hope to name a new GM on Monday. All four candidates are 43 and younger, with Caserio coming in the youngest at just 38 years of age. None have prior GM experience and only one (Dawson) played in the NFL. Gaine, 40, is the lone internal candidate among the group, having served as assistant GM under Ireland for the last two seasons. He joined the Dolphins in 2008, coming over from Dallas with Ireland and Bill Parcells. The New York Jets interviewed him for their GM vacancy in 2013. Dawson, 42, played wide receiver for the Kansas City Chiefs (1994-97), having been drafted by Carl Peterson, who is an adviser to Dolphins owner Stephen Ross and has reportedly been an integral part of the GM search. He worked in the Seahawks' personnel department from 2001-06 before joining the Titans, where he was elevated to his current role as vice president of player personnel in 2012. Hickey, 43, has spent the past 18 seasons in the Buccaneers' organization, most recently as director of player personnel under GM Mark Dominik. He previously worked for the team as a personnel assistant, college scout and director of college scouting. Caserio represents the newest candidate to be brought in the mix, having conducted his first interview on Saturday and then a follow-up interview today. He is currently the Patriots' director of player personnel, having served under various titles with the team in 2001. He was Bill Belichick's wide receivers coach in 2007 when Tom Brady threw for 50 touchdowns and Randy Moss caught 23 of them. While it seemed like the Dolphins' field of candidates for the general manager spot had narrowed (either by the team's doing or from candidates withdrawing or taking gigs elsewhere), a new candidate emerged Friday. 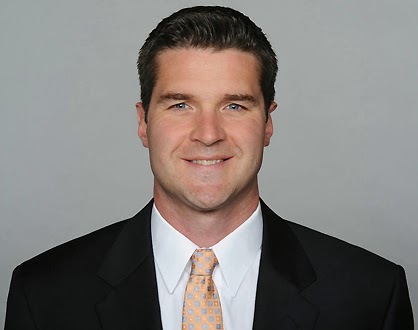 Reports indicate New England Patriots director of player personnel Nick Caserio will interview for the Dolphins' GM opening they was recently believed to be between in-house assistant GM Brian Gaine and Titans exec Lake Dawson. 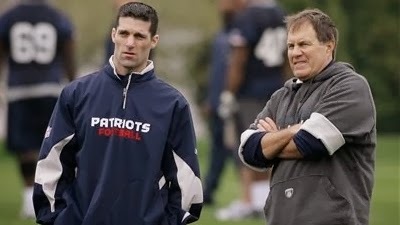 A Bill Belichick disciple, Caserio played college football at John Carroll before joining the Patriots in 2001m working under various assistant and scouting titles. He worked in the personnel department from 2004-06 and served as wide receivers coach during Tom Brady's 50-touchdown season in 2007 before moving into his current position. It's unclear how much interest there is on either side, but Caserio would be a huge get for Stephen Ross after a GM search marred by uninterested candidates, others backing up, questions of power structure and even a report that Ross repeatedly called one candidate by the wrong name in an interview. Caserio, 38, has an impressive track record with one of the best organizations in sports and has learned under quite possibly the best head coach in NFL history. Hiring him Miami would certainly bring a level of respect that has been lacking during the Ross era. The Dolphins reportedly hope to have a new GM hired by Monday, which gives Caserio a late start considering Gaine and Dawson have already had multiple interviews. a breakout season in 2013 with 11.5 sacks. While Wake amassed "just" 8.5 sacks in 2013, matching his career lowest total as a full-time starter, Wake was once again one of the most consistent and possibly underrated pass rushers in the game. You also can attribute a lot of Olivier Vernon's success (11.5 sacks) to the attention Wake draws on the other side. From a pass-rushing perspective, my only disappointment is the lack of consistent playing time for No. 3 overall pick Dion Jordan, who certainly has the physical tools to be an impact player and should have been given a bigger stage to show what he can do. I have a lot of issues with the coaching staff's performance in 2013 and the under-utilization of Jordan is one of them. Moving inside, the Dolphins went three-deep with high-quality starters in Randy Starks, Paul Soliai and Jared Odrick. While only a two-down player, Soliai proves to be a quality nose tackle with surprising range. Starks continues to be one of the most well-rounded players at his position from run defense to pressure, while Odrick had what I'd easily consider a breakout season. The one negative at the interior defensive line position was a swing-and-a-miss by Jeff Ireland, who inked tackle Vaughn Martin to a two-year, $4 million contract only to see him released on Nov. 8 with an injury settlement. The defensive line is certainly something to watch this offseason for a number of reasons. The Dolphins seem quite set in the pass rush department with Wake, Vernon and Jordan, although Wake turns 32 later this month, Vernon has to prove he's not a one-year wonder and Jordan has to prove himself entirely. The good news is that Jordan is a tremendous physical talent and Cameron Wake is signed to a pretty team-friendly deal and is easily the hardest worker on the team that is always in peak physical condition, so his drop-off with age shouldn't happen rapidly. Defensive tackle is where a lot of changes could happen as both Starks and Soliai are free agents. Odrick will return as a quality starter at one spot, but right now the only other tackles the team has are journeyman Isaako Aaitui and 2013 undrafted free agent A. J. Francis. I suspect the 30-year-old Starks will get a pretty solid payday elsewhere, while it's no lock that Soliai returns either if his agent David Canter is to be believed. That being said, I expect Soliai to be back as there's never been a huge market for him and he only plays about half a team's defensive snaps. The Dolphins would be wise to do another two-year deal with Soliai and explore an extension with Odrick, who is entering the final season of his rookie deal. Should the Dolphins fail to retain Starks and Soliai, the 2014 starter alongside Odrick is almost certainly not currently on the roster. Linval Joseph (Giants), Jason Hatcher (Cowboys), Pat Sims (Raiders), Tyson Jackson (Chiefs) and former Dolphins lineman Tony McDaniel (Seahawks) are some of the better names available in free agency. Louis Nix (Notre Dame), RaShede Hageman (Minnesota), Stephon Tuitt (Notre Dame) and Timmy Jernigan (Florida State) are first-round draft options, although the team certainly has bigger needs to fill at No. 19. Dolphins head coach Joe Philbin made his first addition to the position coaching ranks of his 2014 staff, hiring former Jaguars linebackers coach Mark Duffner for the same role in Miami. for three different head coaches from 2006-13. The 60-year-old Duffner replaces George Edwards, who was in his second stint with the Dolphins before becoming the Vikings' defensive coordinator under new head coach Mike Zimmer. A William & Mary alum, the former collegiate defensive lineman began as a graduate assistant under Woody Hayes at Ohio State in 1975 before holding defensive coordinator roles at Cincinnati and Holy Cross. He was head coach at Holy Cross (1986-91) and Maryland (1992-96), compiling an overall record of 80-40-1. Duffner's first NFL work came as the Bengals' linebackers coach in 1997 and he later added the title of defensive coordinator. He joined Mike Sherman's staff in Green Bay, serving as linebackers coach from 2003-05 when Joe Philbin was working with the Packers' offensive line and tight ends. After leaving Green Bay, Duffner served as linebackers coach in Jacksonville under three different head coaches—Jack Del Rio, Mike Mularkey and current head coach Gus Bradley. In Miami, Duffner will have his hands full two two massive free agent busts in middle linebacker Dannell Ellerbe and Philip Wheeler. Both have contracts that likely keep them in Miami through at least 2014, while there is little youth to speak at the position aside from 2013 fourth-rounder Jelani Jenkins. 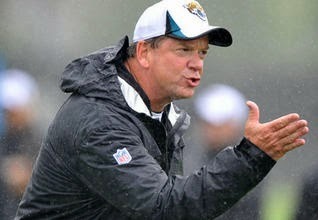 Duffner becomes the second new assistant added by Philbin this offseason, joining offensive coordinator Bill Lazor. The team's general manager search is ongoing and reports indicate the pool may expand beyond the six already interviewed. 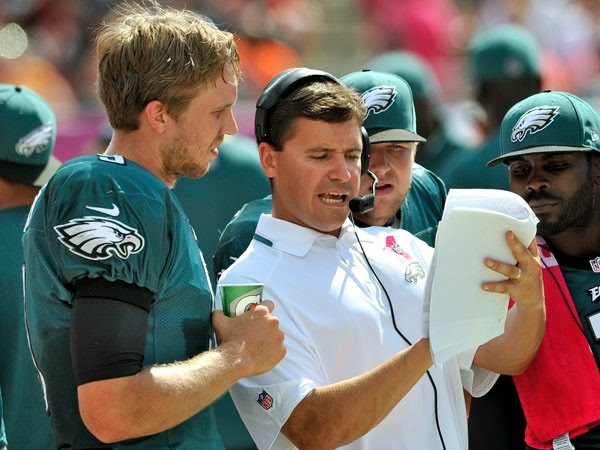 In a surprising turn of events, Eagles quarterbacks coach Bill Lazor has agreed to become the new offensive coordinator for the Miami Dolphins, according to reports. the University of Virginia from 2010-12. The news conflicts with Tuesday reports which had Lazor leaving the Eagles for Detroit, where he would become the Lions' offensive coordinator under new head coach Jim Caldwell. Combined with yesterday's news that Packers quarterbacks coach Ben McAdoo was the Giants, things were looking bleak for the Dolphins' coordinator job heading into Wednesday. Although he has never been a play-caller at the NFL level, Lazor comes with a nice track record working under quality head coaches (Dan Reeves, Joe Gibbs, Mike Holmgren, Chip Kelly) and is coming off a season of tutoring Pro Bowl quarterback Nick Foles. 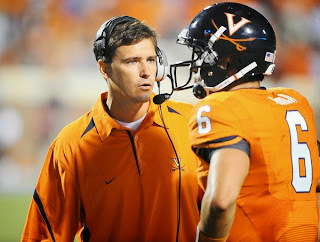 Lazor did serve as offensive coordinator at the college level with Buffalo (2000-01) and Virginia (2010-12). While it's impossible to know what to expect from a first-time NFL play-caller, it seems likely the 41-year-old Lazor will bring the Dolphins' offense into the 21st century after a season under the brilliant Chip Kelly in Philadelphia. He certainly can't do much worse than departed Dolphins coordinator Mike Sherman, who led the Dolphins to a 27th-ranked offense in back-to-back seasons with some mind-numbing faults. In Miami, Lazor inherits a third-year quarterback in Ryan Tannehill, who statistically improved in 2013 and certainly has the tools to get better. I worry about Tannehill's pocket awareness, deep ball accuracy and overall instincts at the position, but Lazor's presence may very well do Tannehill some good despite bringing the challenge of a new offense. The Dolphins also have a solid running back in Lamar Miller, more than capable wideouts in Mike Wallace and Brian Hartline, and an emerging receiving tight end in Charles Clay. However, the problematic offensive line that allowed 58 sacks in 2013 remains a huge question mark, with only center Mike Pouncey a lock to return as starter. In a curious move, Wednesday reports indicate head coach Joe Philbin has opted to keep his offensive position coaches under Lazor. One would have assumed quarterbacks coach Zac Taylor and offensive line coach Jim Turner, who have ties to Sherman from their time at Texas A&M, would have been shown the door if anything. 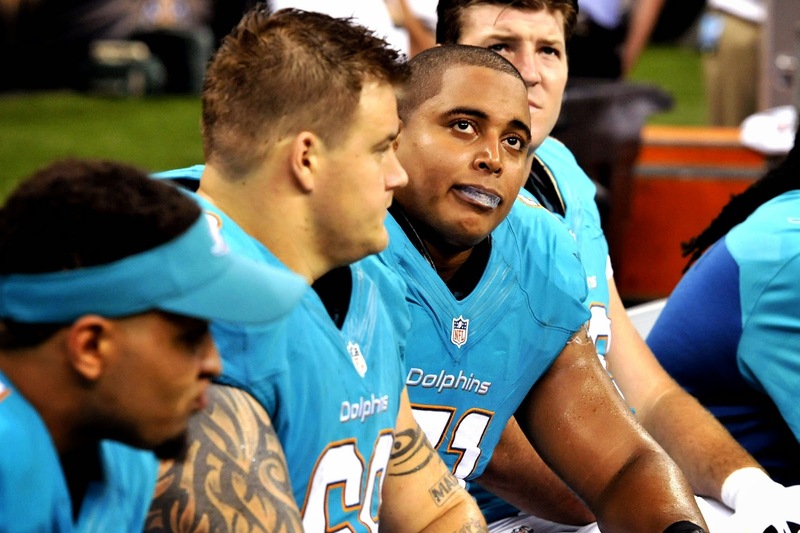 However, it's possible the team might make such a move after the report on the Richie Incognito-Jonathan Martin scandal is released. A Wednesday report indicates Vikings assistant general manager George Paton is expected to interview for the Dolphins' vacant GM position. Paton began his NFL career working for the Chicago Bears, ascending to the role of assistant director of pro personnel in 2001. He worked with current Vikings and former Dolphins GM Rick Spielman in both Chicago and Miami. A UCLA alum, Paton would join five of the other six Dolphins GM candidates in having no prior NFL GM experience. He did, however, interview with the Rams for their open GM spot in 2012. Add a sixth man to list of Dolphins general manager candidates, as Chris Mortensen reported Tuesday that Detroit Lions executive Brian Xanders is expected to mean with the team. Xanders joined the Lions in 2013 as a senior personnel executive following five seasons (2008-12) with the Denver Broncos, including the last four as general manager. 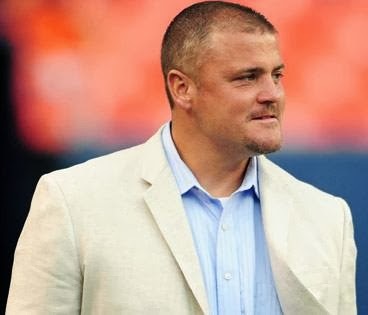 The Broncos and Xanders agreed to part ways following the 2012 season with executive vice president John Elway controlling personnel decisions. Xanders originally played linebacker at Florida State under Bobby Bowden (1989-92) before joining the Atlanta Falcons' personnel department, where he worked under various titles from 1994 to 2007. The 42-year-old Xanders joins Lake Dawson (Titans), Ray Farmer (Browns), Omar Khan (Steelers) Jason Licht (Cardinals) and Dolphins assistant GM Brian Gaine as those that have interviewed with the Dolphins thus far. Xanders holds the distinction as the only one of the six candidates to have prior GM experience in the NFL. While his tenure is often remembered for the selection of "quarterback" Tim Tebow in the first round of the 2010 NFL Draft, it's important to note that head coach Josh McDaniels had personnel control at that time and was Tebow's biggest advocate. Among the other players drafted when Xanders was GM of the Broncos are wide receiver Demaryius Thomas (1st), Zane Beadles (2nd), Eric Decker (3rd), Von Miller (1st), safety Rahim Moore (2nd), tackle Orlando Franklin (2nd), tight end Julius Thomas (4th), defensive lineman Malik Jackson (5th) and linebacker Danny Trevathan (6th). Xanders also saw the arrival of Peyton Manning in Denver, though I'm thinking John Elway had a lot to do with that. As the Dolphins continue their search for general manager, the pool of candidates for the also-vacant offensive coordinator position on Joe Philbin's staff is thinning rapidly. Eagles quarterbacks coach Bill Lazor opted to take an offensive coordinator position in Detroit under Jim Caldwell, while Packers quarterbacks coach Ben McAdoo has opted for the play-calling gig in New York under Giants head coach Tom Coughlin. That leaves the only known candidates as former Texans head coach Gary Kubiak and former Redskins offensive coordinator Kyle Shanahan. However, Kubiak seems more interested in pursuing other opportunities and Shanahan's interview with the Dolphins reportedly did not go well. Considering the instability of the Dolphins' organization and the very possible situation of Philbin being out after one season with a new general manager, the coordinator position might prove difficult to fill from the outside, which could lead to a very unsexy promotion of receivers coach Ken O'Keefe, who called plays at Iowa. joined the Dolphins as free agents in 2013. The Dolphins made it a point to get younger at the linebacker position this offseason, parting ways with veterans Karlos Dansby and Kevin Burnett while signing free agents Dannell Ellerbe and Philip Wheeler. I should say right now that I have no issues with moving on from Dansby and Burnett. People will point to Dansby's fantastic 2013 campaign with the Cardinals as evidence the Dolphins made a mistake, but I don't see it that way. Dansby got worse each season in Miami, showing up to camp overweight after the NFL lockout (ruining him for half the season) and growing ever more arrogant and delusional. As far as I'm concerned, getting cut by the Dolphins woke him up and helped him right the ship in Arizona, meaning the Dolphins could not have reasonably expected similar production from him in Miami this season. That being said, while it was not a mistake ditching Dansby and Burnett, it was a mistake replacing them with Ellerbe and Wheeler, who turned out to be some of the biggest free agent busts in recent Dolphins history. Simply put, when discussing the Dolphins' defensive problems in 2013, it begins and ends with Ellerbe and Wheeler. A former undrafted free agent out of Georgia, Ellerbe filled in admirably for Ray Lewis during the Ravens' 2012 Super Bowl run and landed a five-year, $34.75 million contract from the Dolphins in the offseason. Replacing Dansby at middle linebacker, Ellerbe was a disaster, slow to react to play, taking horrible angles, moving with the agility of a disabled penguin and getting out-muscled by smaller players. He graded out 50th out of 55 in Pro Football Focus' inside linebacker rankings. As bad as Ellerbe was, Wheeler was even worse. Coming off a strong season with the Raiders, Wheeler cashed in with a five-year, $26 million contract in Miami. His play was simply horrendous, as he too took terrible angles, missed tackles and often looked lost in coverage. The one area he showed well was rushing the passer, ranking behind only Von Miller among 4-3 outside linebackers with 23 hurries. Even still, PFF graded him as the worst 4-3 OLB in the league among 35 candidates. Somewhat the forgotten man, Koa Misi is often invisible when watching games and will never be confused with a playmaker, but he's actually the best of his group thanks to his strong production against the run. That being said, I wouldn't rule out the possibility of Wheeler getting the ax this offseason. The Dolphins currently project to have about $38 million in cap space and could reach $50 million with some reasonable cuts elsewhere, meaning the team could handle losing about $4 million of that space by cutting Wheeler if they truly feel he has no place on the roster. Ellerbe, who was slightly better than Wheeler, could then be given another year to earn his money and be cut in 2015 with cap savings if needed. Misi is signed reasonably at $1.7 million in 2014, but his salary jumps after that and he's signed through 2017. If the Dolphins do decide to part with Wheeler, 2013 fifth-round pick Jelani Jenkins played 127 defensive snaps as a rookie and could potentially replace him on the weak side, though his overall upside is debatable. Bringing in another rookie or a short-term free agent to compete with Jenkins might be ideal. Regardless of what the Dolphins do and when, it's clear that the current linebacker corps isn't long for the team. Ellerbe and Wheeler will need to be replaced at some point in the next year or two, while Misi is a fairly average player and could always be upgraded. While it's not a priority this offseason over, say, the offensive line, linebacker is certainly a position that's going to need an overhaul in the near future. The Miami Dolphins concluded a busy weekend in the search for their next general manager, as Titans executive Lake Dawson interviewed with the team on Sunday. Kansas City Chiefs from 1994-97. Dawson is the fifth candidate to interview for the job vacated by Jeff Ireland, joining the trio from Friday (Omar Khan of the Steelers, Jason Licht of the Cardinals and Dolphins assistant GM Brian Gaine) and Browns assistant GM Ray Farmer, who met with Dolphins brass on Saturday. Farmer has been regarded as some as the favorite for the Dolphins' GM job, given his connection with Stephen Ross adviser Carl Peterson from their time together in the Chiefs' front office from 2006-08. However, Dawson too has a connection to Peterson, who was the Chiefs' president and general manager when the team drafted Dawson as a wide receiver in the third round of the 1994 NFL Draft out of Notre Dame. 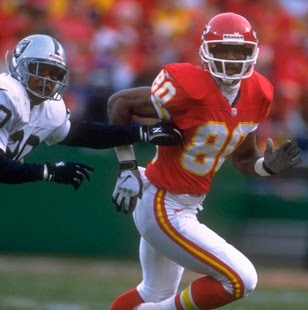 Dawson played four seasons for the Chiefs and later spent time with the Colts before retiring due to injury, finishing his career with 103 catches and 10 touchdowns. He later worked in the personnel department for the Seattle Seahawks from 2001-06 before joining the Tennessee Titans, eventually elevating to vice president of player personnel in 2012 under general manager Ruston Webster. As with the previous four interviewees, Dawson has no prior NFL general manager experience and is fairly young, having turned just 42 earlier this month. It's also worth nothing that Dawson is the third minority candidate to interview with the Dolphins, meaning the team has more than complied with the Rooney Rule that also applies to head coaching hires. The Dolphins could possibly look to name the new GM sometime this week, as the Senior Bowl interviews and scouting process is just over a week away. As promised, the Miami Dolphins announced the initial group of candidates that interviewed for the team's general manager position vacated by Jeff Ireland. for the past two seasons and initially joined the organization in 2008. Current Dolphins assistant GM Brian Gaine, Pittsburgh Steelers director of football operations Omar Khan and Arizona Cardinals VP of player personnel Jason Licht all met with Dolphins owner Stephen Ross on Friday, while Browns assistant GM Ray Farmer interviewed on Saturday. Other potential candidates being discussed include Lake Dawson (Titans), Tom Gamble (Eagles) and Marc Ross (Giants). Ravens assistant GM Eric DeCosta was of interest to the Dolphins but declined to interview, as he is widely regarded as the heir to Ozzie Newsome in Baltimore. Former Kansas City Chiefs president Carl Peterson—a known Ross adviser—is spearheading the GM search, according to the Miami Herald. The same article also suggests that Dolphins executive vice president of football administration Dawn Aponte could be losing power in the process after having a significant hand in the hiring of head coach Joe Philbin in 2012. Peterson's involvement has led many to believe that Farmer is the favorite for the job, as the 39-year-old was the Chiefs' director of pro personnel during the final three seasons of Peterson's tenure in Kansas City from 2006-08. One thing all the candidates have in common thus far is a lack of prior GM experience, which could be intentional or unintentional on Miami's part. The Dolphins came out and said the next GM would have power over the 53-man roster, but it appears that he/she will not have the power to fire the next coach. That potentially eliminates more experienced candidates that would stipulate the ability to bring in their own head coach. That being said, it's also possible the Dolphins are simply looking for a younger, fresher face to lead the franchise in the years to come. Not one of the four candidates that has interviewed thus far is older than 42 (Licht), with Khan the youngest at just 36. There are certainly positives to bringing in GM with a newer outlook on the game and every great GM had to get their start somewhere. Overall, I'm pleased with the group of candidates that have been interviewed and I'd be happy with practically any of them getting the job. I'm still concerned that Philbin is being forced on the new GM (especially since I'd prefer him to be gone already), but I think it's very likely Philbin will be out after 2014 barring a very hugely successful season and perhaps then the new GM can really begin to make the franchise his own. In the 2009 NFL Draft, the Dolphins doubled up on cornerback by taking Vontae Davis in the first round and Sean Smith in the second round. The Dolphins dealt Davis to the Colts prior to the 2012 season and lost Smith to free agency last year, giving the position a whole new look for the 2013 campaign. The Dolphins once again doubled up in the draft, taking Boise State's Jamar Taylor in the second round and Utah's Will Davis in the third round. However, Taylor was limited for much of the season due to injury and Taylor proved to be a work in progress, with the two combining to play just 110 defensive snaps in six game between them. The star of the secondary proved to be veteran cornerback Brent Grimes, who was signed to a bargain one-year deal coming off a torn Achilles' with the Falcons in 2012. Grimes proved the injury didn't sap any of his ability and played at a shutdown level throughout the season, not allowing a single touchdown pass while earning his second career Pro Bowl selection. Veteran Dimitri Patterson, who was claimed off waivers in 2012, showed why the Dolphins parted ways with Richard Marshall prior to the season. Patterson intercepted four passes in six games played, battling injuries throughout the season and eventually landing on injured reserve. Finally, 2010 fifth-rounder Nolan Carroll proved to be a capable role player at the position, ranking 4th in the NFL allowing receptions on just under 48 percent of passes thrown his way. His season was once again marked by inconsistency with bad games sprinkled in between the good ones, but overall Carroll held his own and contributed a good amount for a mid-round pick. While there is plenty of good to say about the cornerback position in 2013 despite the lack of rookie participation, the same cannot be said for safety. Chris Clemons performed admirably in coverage most of the time and remained an adequate starter, but the real issue was Reshad Jones, who followed up his standout 2012 campaign (and ensuing $30 million contract) with an inexplicably horrible season. A year after grading out as Pro Football Focus' No. 3 safety, Jones plummeted to 68th. I can certainly vouch for such a grade, as Jones made terrible decisions in coverage, took bad angles in pursuit and forced five fewer turnover than he did last season. Jones can obviously play a lot better than he did in 2013 and I don't know if the blame falls on the player for cruising after earning a big contract or defensive coordinator Kevin Coyle shaking up his utilization, but whatever was broken this past season needs to be fixed. 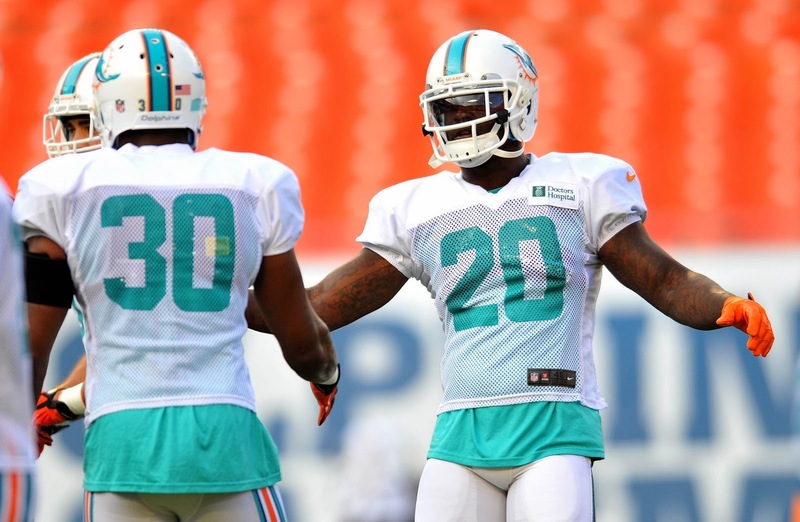 The Dolphins enter the offseason with a number of questions in their secondary. Two of the four starters—cornerback Brent Grimes and free safety Chris Clemons—are unrestricted free agents, as is valuable nickel man Nolan Carroll. Reserve corner R. J. Stanford (RFA) seems unlikely to be tendered (though he could be bought back on a cheaper deal), while Week 15 hero Michael Thomas (ERFA) is likely to return for camp. I would expect the Dolphins to push heavily to re-sign Grimes, though the 30-year-old will certainly explore other options coming off a tremendous season and likely looking for one big payday. It would behoove Miami to try and work out a two- or three-year deal worth somewhere between $6-8 million per season. The franchise tag is an option as well, although Grimes was already tagged once with the Falcons so that option could get pricey for the Dolphins. What happens with Grimes could affect Dimitri Patterson's roster status as well. I suspect the Dolphins will try to get younger and cheaper at the position if they keep Grimes, meaning Patterson could be on the chopping block. Despite impressive play in 2013, Patterson's durability is an issue and the team would save $5.4 million against the cap if they release him. My initial prediction with Carroll is the team lets him walk, as there's potentially more money for him to be made elsewhere after showing some potential in 2013 and the Dolphins have two high draft picks invested in Jamar Taylor and Will Davis. Taylor was considered a steal in the second round and is basically coming off a redshirt rookie campaign, so it'd be a disappointment if he doesn't start during the 2014 season. I do expect the Dolphins to pursue a new deal with Chris Clemons at free safety, who should draw starting interest in the free agent market but won't command a particularly cumbersome salary. Clemons have proved to be a reliable starter and keeping him around for consistency (and to avoid replacing him) would be ideal. The Miami Dolphins are currently without a general manager, but the search for Mike Sherman's replacement as offensive coordinator is already underway as the team is reportedly interviewing Eagles quarterbacks coach Bill Lazor for the position on Wednesday. Matt Barkley and Michael Vick in 2013. A former college quarterback at Cornell (1991-93), Lazor spent seven seasons as an assistant at his alma matter before becoming the the offensive coordinator/quarterbacks coach at the University of Buffalo in 2001. He has spent much of the past decade in the NFL, serving as an offensive assistant in Atlanta (2002-03) and Washington (2004-05), as well as holding quarterbacks coach positions with the Redskins (2006-07), Seahawks (2008-09) and Eagles (2013-present). 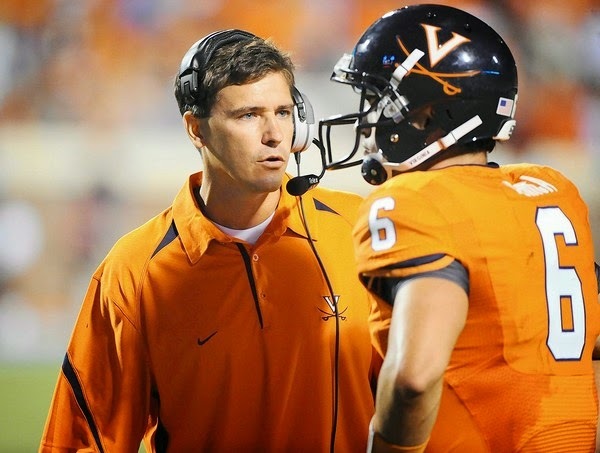 From 2010-12, Lazor served as OC/QB coach at the University of Virginia under Mike London. Lazor is certainly a hot name right now given the immense success of Chip Kelly's offense in Philadelphia. Second-year quarterback Nick Foles emerged as a true star in 2013 after replacing an injured Michael Vick, going on to post one of the highest single-season passer ratings in NFL history. While it's impossible to know just how much impact Lazor had on Foles' development given the offensive brilliance of Kelly, it's certainly fair to assume Lazor had some impact. The 41-year-old has an impressive résumé after working under Dan Reeves, Joe Gibbs, Mike Holmgren and with quarterbacks such as Foles, Vick (both in Atlanta and Philadelphia), Mark Brunell and Matt Hasselbeck. Lazor certainly seems like a quality candidate to interview for the coordinator position, even if he never has held the title in the NFL. However, the larger issue with the interview already taking place is that it indicates head coach Joe Philbin is almost certainly safe in 2014 and that his presence is "part of the deal" when it comes to owner Stephen Ross searching for a new general manager. I personally lost a lot of faith in Philbin after the Dolphins' late-season collapse and with Jeff Ireland gone I was hoping for a total overhaul in personnel. Forcing Philbin onto the next GM limits the candidate pool, potentially the more high-profile, experienced candidates. 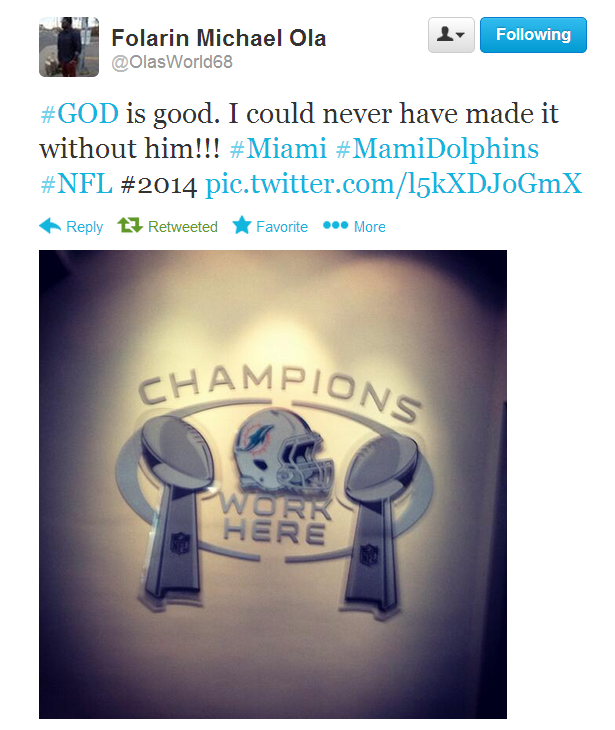 It's possible the Dolphins plan to keep Philbin for only one more season barring a tremendous turnaround. Some have suggested the team could pursue Eagles exec Tom Gamble and then try and land 49ers head coach Jim Harbaugh in 2015, but there are a lot of moving parts there and I'm not going to hold my breath. For now, I'm concerned that Ross still simply "doesn't get it" and that he's continuing to try and mix and match pieces that don't fit. That's been a recipe for mediocrity in the past and if Ross isn't putting his best foot forward then the team doesn't stand much of a chance of turning things around. That sound you heard Tuesday afternoon was millions of Dolphins fans cheering with the news that Jeff Ireland would no longer be the team's general manager, as the sides reportedly "mutually agreed to part ways" after six seasons. The news comes a day after the firing of offensive coordinator Mike Sherman and less than two weeks after the Dolphins let a playoff berth slip entirely from their grasp. Head coach Joe Philbin currently remains safe heading into his third season on the job, although everyone is up in the air until the dust settles and a new general manager is named. Dolphins VP of Football Administration Dawn Aponte is currently in charge of football operations and is considered by some to be a candidate to replace Ireland, although her background is in salary cap management and not football scouting and evaluation. Meanwhile, Assistant GM Brian Gaine has been told nothing about his status with the team. Thought of by many around the league as an up-and-coming personnel man, Gaine interviewed for the Jets' GM opening last offseason and would likely be the top in-house candidate if the Dolphins go that route. However, NFL.com's Jeff Darlington and others say the Dolphins's GM position is "highly-coveted" by top personnel men around the league, meaning the team could target a high-profile, experienced name like Mike Tannenbaum, Scott Pioli, Bill Polian or Carl Peterson. Owner Stephen Ross apparently also has a strong relationship with former Jets and Browns head coach Eric Mangini and some have suggested Ross could be willing to give him personnel power. The team could also go with the less experienced route, with potential candidates including Omar Khan (Steelers), Jason Licht (Cardinals), Eric DeCosta (Ravens), Ray Farmer (Browns), Brian Gutekunst (Packers), Marc Ross (Giants), Jon Robinson (Patriots) and Brian Garner (Texans). Meanwhile, today's decision brings an end to a disappointing tenure for Ireland in Miami. He arrived in 2008 under Executive VP of Football Operations Bill Parcells and fully assumed control over personnel matters in 2010 with Parcells' departure from the organization. The Dolphins won the division in Ireland's first season with the team in 2008, thanks in large part to Tom Brady's torn ACL and Chad Pennington falling into their laps after being cut by the Jets. But the team is just 35-45 since, failing to reach the playoffs each of the past five seasons despite a head-coaching change in 2012 and plenty of money spent on free agency. Ireland's final season on the job will long be remembered for its failure to make the playoffs despite controlling its destiny heading into Week 16. He overpaid free agent receiver Mike Wallace, who is a talented deep threat but not a true No. 1 target. And of course, the signings of linebackers Dannell Ellerbe and Philip Wheeler proved to be disastrous on the field and an enormous waste of team resources. Still, it would be unfair to Ireland to talk about all the bad moves he made without highlighting some good ones. Quality draft picks include Jake Long (1st), Kendall Langford (3rd), Brian Hartline (4th), Chris Clemons (5th), Jared Odrick (1st), Nolan Carroll (5th), Reshad Jones (5th), Mike Pouncey (1st), Charles Clay (6th) and Olivier Vernon (3rd). Brent Grimes, Randy Starks and Cameron Wake highlight some strong free agent additions. One must also wonder if the departures of Sherman and Ireland are truly enough for this franchise. I personally place the collapse in Weeks 16-17 squarely on Joe Philbin and I question whether or not he's capable of truly leading the team. Plenty, including myself, believe the team had the talent to get to the playoffs despite some issues, which means Ireland was certainly not the whole problem. That's why the Dolphins need to bring in a new GM that will clean house and hire his own people, and that includes getting rid of Philbin. Firing a head coach and not the GM, or vice-versa, just doesn't work and it's as if they are trying to patch something together that's clearly broken. Let us hope the Dolphins' general manager position is indeed as attractive as some are reporting, and let us also hope Stephen Ross takes advantage of that and finally hires someone that can point this team in the right direction, even if that means starting over in the process. 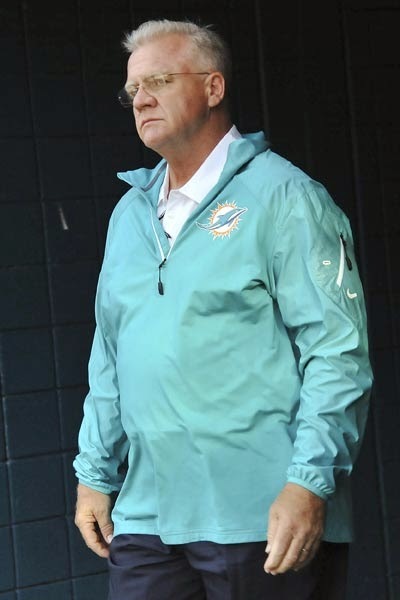 Even for the most pessimistic of Miami Dolphins fans (and I likely fall somewhere in that group), the return of Mike Sherman for a third season seemed too improbable to come to fruition. Indeed, the Dolphins did take the first step to remedy their struggles of the 2013 campaign, as head coach Joe Philbin relieved his former coach and mentor of his duties on Monday. It was clearly a difficult decision for Philbin, even though it's likely one he knew had to be made. The two go back to 1980 when Philbin a student-athlete at Worcester (Mass.) Academy and Sherman was his football coach and English instructor. In 2003, Sherman (then head coach of the Packers) gave Philbin his first NFL coaching job as an assistant offensive line coach. But reports emerged recently that Philbin was questioning Sherman's play-calling during the season, and I should hope for the sake of Philbin's own intelligence the report is true. It's also entirely possible Philbin was presented with an ultimatum from above, as in "Get rid of Sherman or you're both gone." There are excuses to be made, even for Sherman. Ryan Tannehill was playing just his second pro season at a quarterback position that often takes years to master. Tannehill himself still has major issues in his game, starting with accuracy and pocket presence. The offensive line was horrendously ineffective, even before Richie Incognito and Jonathan Martin departed the team in a cloud of media-fueled scandal. Projected starting tight end Dustin Keller was lost to a knee injury before the season and slot receiver Brandon Gibson was lost to one in Week 8. Nevertheless, Sherman was certainly a large culprit in the Dolphins' offensive struggles this season, with the team finishing 26th in points per game (19.8) and 27th in yards for the second consecutive season. Some of Sherman's baffling decisions and failure to bring his schemes into the 21st century were a humongous issue. Sherman routinely abandoned the run early in games and became one-dimensional and predictable in his calls. His progression-based offense reportedly held Tannehill back from finding his open receivers, with a recent report saying the quarterback had grown weary of his long-time coach. Sherman failed to get the ball into the hands of his playmakers by changing routes and moving players around in formations to create mismatches in coverage. And let's not forget the whole "Go, Go!" fiasco. The whole thing makes me feel like an idiot, because I question how much I know the sport if a professional team keeps doing it the same way despite how stupid it seems. I've never played football at a pro level, but I can't understand how "Go!" for run and "Go Go!" for pass nearly 100 percent of the time doesn't tip off a defense. Even play-action passes were "Go Go!" which entirely defeats the purpose of play-action. It was truly baffling to watch all season and I cannot find any reason in it. Sherman was a dinosaur as an NFL offensive mind and moving on from him was the most obvious choice for the Dolphins to make this offseason. But the question remains, 'Is it enough?' Does offensive line coach Jim Turner (brought from Texas A&M with Sherman) need to be held accountable for his unit's performance? Does the same go for quarterbacks coach Zac Taylor, a former A&M grad student and Sherman's son-in-law? What about Philbin failing to inspire an ounce of effort from his team in the final two games of the season, where one win against an inferior opponent would have sent the Dolphins to the playoffs? And then you have Jeff Ireland, who has a bad move in his past for every good move he's ever made. How do you explain the disastrous signings of linebackers Dannell Ellerbe and Philip Wheeler, or the complete failure to address the offensive line? If you blame Philbin, do you not also blame the man who hired him? And even then, what if the man in charge of it all—owner Stephen Ross—isn't capable of making good decisions, either? I said over the last few days on Twitter that no matter how little faith I had in the Dolphins organization right now, I couldn't envision Sherman keeping his job. That proved to be true. But Ireland remains at his post and Philbin appears to be safe for the 2014 season, given the fact that the team released a statement by the head coach along with the Sherman news. We know the Dolphins will have a new offensive coordinator in 2014, and position coaches may be shuffled in and out as well. It's also still "possible" that Ireland gets shown the door, but that seems unlikely given Ross' past hesitations. However, there's a large amount of concern among us that the entire system is broken and that the owner is too afraid, too careful, or too whatever to make the necessary changes. Barring all that, firing Sherman doesn't fix the problem. It is, as someone said on Twitter, treating cancer with a band-aid. Firing Sherman might not be the fix we need, but rather just delaying the inevitable rebuild coming down the road. Always a franchise looking to mine for talent from our neighbors to the north, the Miami Dolphins brought in their first fresh face of the 2014 offseason with the signing of Canadian Football League veteran Michael Ola. A former right tackle at Hampton, Ola went undrafted in 2011 and had a brief stint in the arena league in 2012 before heading to the Montreal, where he played the last two seasons for the CFL's Alouettes. Full information on games played/started is currently unavailable, but it appears Ola primarily played right tackle for the Alouettes as well. In the NFL, however, Ola projects as more of an interior lineman and should see most if not all of his offseason work with the Dolphins at one of the guard positions. Both of the Dolphins' starting guards entering the 2013 season—Richie Incognito and John Jerry—are unrestricted free agents and seem unlikely to return (almost certainly in Incognito's case). Meanwhile, backup Danny Watkins (a former first-round pick of the Eagles) is a restricted free agent. That currently leaves Sam Brenner and Nate Garner on the left side and David Arkin on the right side, making it seem likely Ola slides into the right guard competition with Arkin. However, it's quite possible if not probable that neither of the Dolphins' starting guards in 2014 is currently on the roster. The Dolphins obviously saw something in Ola's play in Canada to bring him onto their roster, but the 6-foot-3, 278-pound lineman (listed at 325 pounds before the 2011 Draft) will need to bulk up and have a tremendous showing in offseason workouts to make it to training camp and compete for a spot on the regular season roster. Jeff Ireland's tenure as Dolphins general manager may not (hopefully not?) last much longer, but for the time being he is making traditional moves for this point in the year, and that means re-signing practice squad players to future deals to bring back for offseason workouts and training camp. Six such players were re-signed by the Dolphins this week, including defensive tackle Isaako Aaitui, running back Cameron Marshall, tight end Kyle Miller, fullback/tight end Emmanuel Ogbuehi, wide receiver Ryan Spadola and offensive tackle Jason Weaver. The remaining two players from the Dolphins' practice squad—linebacker Josh Kaddu and wide receiver Reggie Dunn—have not been re-signed by the team as of Thursday. Kaddu was a fifth-round pick out of Oregon in 2012 and played in 5 games for the team before being waived in October, while Dunn was an undrafted rookie from Utah that was signed on Dec. 23. Back for his second go-round with the Dolphins in 2013, Aaitui was a great story in 2012 training camp when he nearly made the the Dolphins' roster and then was claimed by the Jets after final cuts, only to tear his ACL in his first practice with New York and miss the entire season. He signed with the Saints this offseason but failed to latch on and eventually re-joined the Dolphins' practice squad. He played in four games after a promotion to the active roster in October, but was later waived and finished out the season on the practice squad. Aaitui has always been a serviceable backup nose tackle and should have no problem sticking on the offseason roster with Randy Starks and Paul Soliai unsigned as free agents. Making the active roster is another story for Aaitui, however. Undrafted out of Arizona State in 2013 where he rushed for over 1,600 yards and 27 touchdowns over his final two seasons, Marshall attended training camp with the Dolphins but was hampered by a hamstring injury and spent the season on the practice squad. Marshal currently slots in 5th on the running back depth chart and I wouldn't expect him to climb much higher barring a breakout performance in offseason workouts. He's more camp fodder than anything else. 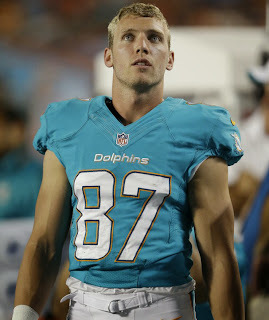 Miller went undrafted in 2012 out of Mount Union and spent time with the Jaguars and Colts before being claimed off waivers by the Dolphins midway through his rookie season. He spent the entire 2013 season on the practice squad after losing a training camp battle with former third-round pick Michael Egnew. 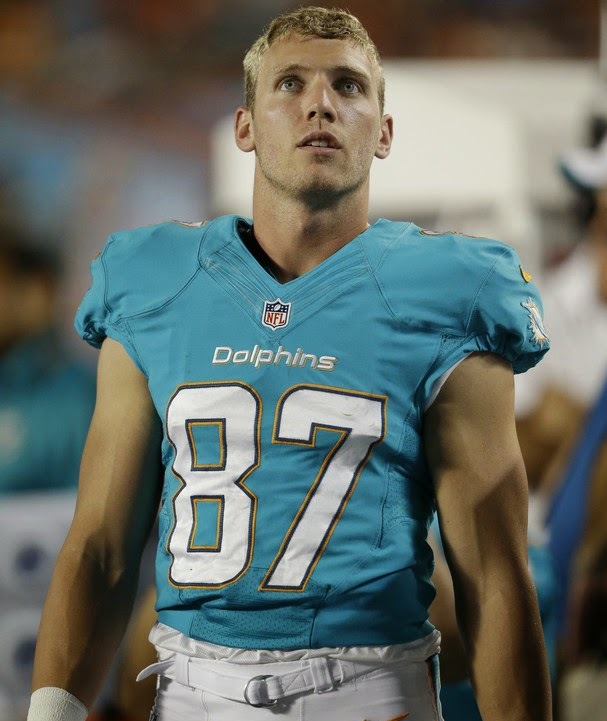 All three of the Dolphins' top tight ends remain under contract (Dustin Keller is a free agent), so Miller is once again on the outside looking in for a roster spot in 2014. A fellow Georgia State alum, Ogbuehi went undrafted in 2013 and spent training camp with the Washington Redskins. He initially worked out for the Dolphins in September, but remained unsigned until joining the team's practice squad during the final months of the season. I'm unsure at this point if Ogbuehi is working more at fullback or tight end, but the former wouldn't surprise me given the bodies at tight end and the way Egnew was utilized in the backfield this year as well. Regardless of the position, Ogbuehi is an extreme long shot in 2014. Spadola was a standout receiver at Lehigh before going undrafted in 2013 and signing with the New York Jets. He appeared in three games for the team as a special-teamer before his release and soon after signed to the Dolphins' practice squad. A one-game stint on Miami's active roster (Week 9 vs the Bengals) was book-ended by another stint on the practice squad. Currently, Spadola slots in as the Dolphins' sixth receiver out of six, if you ignore Brandon Gibson's knee injury and include restricted free agent Armon Binns (also recovering from a knee injury). The top of the depth chart is set at the position, which will leave Spadola fighting with numerous additions over the offseason for a special teams role. An All-Conference right tackle at Southern Miss, Weaver was signed as an undrafted free agent by the Tampa Bay Buccaneers in 2013 but was waived before the preseason. After a brief stint with the Bengals, Weaver spent the entire regular season on the Dolphins' practice squad. Right side or left, Weaver currently projects as nothing more than a backup tackle even when taking the team's current free agents into consideration. It's safe to say the position will be a focal point for the Dolphins in 2014, making Weaver's chances of cracking the roster even slimmer.